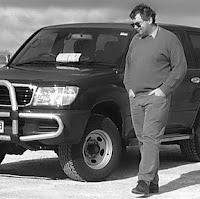 In 2006 a group of modern day 4WD explorers retraced Dr Cecil Madigans 1939 crossing of the Simpson Desert. Prior to undertaking this demanding crossing, I read Medigan's popular account of the expedition in a book titled "Crossing The Dead Heart"
The so called "Dead Heart" was the area to the north of Lake Eyre, now known as the Simpson Desert. Cecil Madigan was an explorer, geographer and scientist. In 1939 he organised an scientific expedition, by camel, across the northern part of the Simpson Desert from Andado Station to Birdsville and then south to Lake Eyre and Marree. The region was originally known as the Arunta Desert and was renamed after A.A.Simpson, the president of the RGSA and sponsor of Medigan's expedition. Simpson died shortly after the expedition's return. The initial chapters are taken up with the search for information, earlier expeditions in the general area, with the introduction of outback iconic characters such as Jack Bejah, the Afghan camelteer that was employed to provide and manage the camels. Tom Kruse, of outback trucking to provides transport with his truck as far as Andado station. The body of the book is a record of the day to day travel, the scientific activities collecting plant and animal specimens, and the social life of the party. While not detailed enough or an accurate account to conduct a modern trip by, it is a fascinating document from a time when travel was very much harder. Here is an accurate and shorten list of key points if you plan to make this crossing. Departed Adelaide by rail for Abminga at that stage the most Northern siding for the Ghan line. Colonel Thomas, manager of the ABC accompanied the scientific party on the train. Tom Kruse the famous Marree Mailman boarded at Hawker with a Harry Ding truck loaded with the parties supplies. Kruse avoided paying his passenger fee by sleeping in his truck while on the train. Travelling on the Ghan all day with a few siding stops. Arrive at 4am at Abminga where they were meet by Fred Sharpe of Andado and Mr Lowe of Dalhousie. By daylight, Tom Kruse had unloaded his truck. Kruse drove the scientific party to Charlotte Waters (by this stage a deserted telegraph station but some 25 years earlier the location of a highly acclaimed movie call “The Native Tribes Of Central Australia” by Gillen and Spencer.). At Charlotte Waters, the scientific party meet up with Jack, Nurie, Andy and the 14 camels. Sharpe arrives later that morning in his camel drawn buggy, an old ford car minus the engine. Only days before their arrival, Sharpe found the body of a dead man at Charlotte Waters and with the assistance of the local police buried the man near the station in an unmarked grave. That night the party shot two ducks and cooked coated in mud as they assumed the natives did. The myth proved to not cook the ducks to the scientific parties liking but it was to Andy’s. A new genus of small fish was found in the creek and named after Madigan. The scientific party drove to Andado with Kruse and supplies. Travel East via Coglin Creek, past the junction with Finke River (Just past Sharpes Grave) then North via Mayfield swamp, Mount Peebles, Mount Day and the Moolta Tablelands. Fred Sharpe along with the rest of the party and camels started to move to Andado. This would take three days. The next morning, Madigan arranged to return Col Thomas to Abminga via the truck and with the scientific parties’ city clothing for holding and collection at Marree on their return. On the return trip to Andado with Kruse, Madigan established camp along the Finke River. The next morning Madigan explored the table lands around the Finke River before returning to the Andado station. That afternoon the camels and other members arrived at Andado and in the evening McDill arrived with pack horses. On arrival Jack was disappointed with feed around the station and moved them several km’s up the valley to find feed. The party filled the large camel canteens with the good quality water from the Andado well. Fletcher arranges a team to collect marsupial mice until dark. That night when using the wireless, they found three valves had blown out for no known reason. Extra valves were arranged to be sent by plane to Oodnadatta and then by train to Abminga. This would delay the departure by three days. Set off to the North Bore some 40 km north of Andado via the truck with Kruse. They meet up with Jack, Andy, Nurie and the camels as they were locating suitable feed. The North Bore has a depth of 260m with water laying at 20m below the surface. The bore water is supplied by the Great Artesian Basin. On arrival the windmill and tank was out of action but a Windlass and sand pump was available to recover water. Near the bore are the Waddy trees. (Acacia Peuce) McDill had a load of Waddy posts ready for transporting back to Andado by truck. That day, a bullock was killed at the station for meat during the trip. The meat was rubbed with salt and then hung for a couple of days to drip and dry. Kruse with his truck, along with Sharpe, Crocker, Fletcher and McDill would head back to Abminga to wait for wireless valves and pick up additional petrol. While Crocker and Fletcher were meant to remain along the Finke to collect specimens they elected to join the rest and played cards at the fettlers camp. That day the party saw Ted Colson at Abminga while collecting his mail for his Blood Creek station. Colson wished the party all the best for their crossing. Meanwhile, Madigan and Marshall took photographs of the very red and tall sand dunes near the station. The rest of the party returned from Abminga with wireless valves. Preparations were made for departure from Andado the next day. Departed Andado station via Kruse’s truck for the North Bore. They meet Jack, Andy, Nurie and the camels ready to leave. Camp that night was in a very dead area of spinifex and Mulga. Headed East to Camp 1A. Madigan noted the impressive 18m table lands with porcelain type shale. Around the table lands Buck-Bush and Succulent Munyeroo can be located. Aranlabure Swamp exists South of table lands. Madigan recorded that he could survey the area well from the top of the table lands and noted the sighting of the Twins or Poodinitterra Hill and trees along the Todd and Hale River. The party reached the Twins and climbed the most northern hill where they found a Cairn built by Day in 1915. From the top of the hill the intersection of the two rivers could be clearly seen. On route, a hill and bluff where named after Crocker and Marshall. The large claypan SW side of the twins is called Djibata. 10km North of the twins they crossed the Todd without noticing it. The only sign was the increase in vegetation. Morning started with collection of specimens. Jack and Madigan set of to locate water. Andy located widgetty grubs in the local gum trees which can be detected by the bulge on the trunk the size of a cupped hand. The Grub lives in a small hole just below the bulge and the entrance is marked with a red stain. Madigan noted that Ly-Ly was difficult to extract information from and was concerned that Ly-Ly had forgotten the location of the soak. Ly-Ly disappeared on a camel at 4:00pam and returned the next day at 10am with the location of the soak. Madigan arranged Jack to investigate the location of the soak and returned that afternoon with good news. That night it rained gently. Next morning emu eggs were cooked up for breakfast to Ly-Ly dismay. Head northward between the Hale River and the edge of the tableland until they reached the soak. The native soak called Allua and the Hale was known to the locals as Allitera. This was to be the last fill up point before heading East. The sand was water saturated within a few feet from the surface. A soak was dug six feet deep and twenty feet across. Troughs were made from ground sheets for the camels to drink from. “The real task of their expedition would begin” The next known watering point was Mudloo Well in Queensland some 250km East. They emptied out all of the bore water and topped up all canteens with water from the soak. Madigan describes that water as “Beautiful, clear and soft after it had settled during the night”. They farewell Ly-Ly who would return to Andado. It was nearly noon before they started to head East along the stony tablelands. Much green herbage was available for the camels at Camp 5. Tin cans from dinner were fixed to mulga tree as a land mark indicator. The next morning they found themselves traversing sand dunes and the green herbage was rapidly being replaced by Spinifex. The sand ridges became higher to 15m. After seventy sand ridges after 6 1/2 hours with the only vegetation around being dead needle bushes for firewood, Madigan realises the desert was going to be tough. Apart from a few tree covered claypans with signs of recent water, the dunes became taller and softer. More formidable dunes now around 24m high. At this point no sign of rain as the Spinifex had not flowered for at least a season. Camp 8 was again poorly vegetated and little in the way of good fire wood. That night rain was threatening and shelter made from large ground sheets and the camel boxes were erected. A few of the men made advantage of the shelter for sleeping that night. That night 20 points of rain had fallen making things uncomfortable and unpractical to break camp. Further scientific work was conducted. Madigan worked on his first of three national radio broadcasts that were expected to be given that night but was postponed due to poor reception. The rain continued with an inch recorded by noon. The day was passed by reading books and that night the first broadcast was completed under a ground sheet. In the morning time was spent in camp drying off camel packs and other items. During their stay at Camp 8 they had collected enough water to replace what water had been used. While travelling they passed a clump of trees between dunes. During the day, Andy had found a hole of a marsupial rat. Andy, Fletcher and others started to dig for the mouse and would catch up with the camels latter. The dunes were becoming more irregular and wider on top but still very tall. Madigan noted the extraordinarily constant travel rate of camels at about 2 ½ miles per hour. A second radio broadcast was schedule and conducted around 7:30pm that night. The diggers did turn up that night with a story to tell of depth of hole and not rat found. The sand dunes were the biggest yet reaching 30m. The camels were starting to show signs of fatigue. Feed was poor and very limited. Madigan had considered turning back but knew heading back was going to be more difficult then going forward. Jack Bejah was keen to off load some of the equipment and camels to lighten the load. However Madigan was keen to complete the crossing with all equipment. A special radio message was sent to A Simpson at Ru Rua hospital, North Adelaide when party was midway to the Queensland border. Early the next day they found a clay soil carpeted with munyeroo. No waiting for something better, it was decided that camp would be established and the camels allowed to feed on the munyeroo (Pig-face). Around the area they discovered nodules of ironstone and chalcedony (flint for tools) and former presence of aboriginals. It was clear that aboriginals would travel down south in this area if the season was good. The claypan near the camp had a couple of inches of water and was used to have a hot wash. The tension that had be building over the past few days was now relieved with water supplies topped up and the camels having a good feed. Madigan headed North East to locate some of the claypans that he mapped from the air in 1927. Soon they passed through a grove of Gidgee and green herbage was bore evident. Madigan came across a number of smaller claypans but failed to locate the larger claypan as expected. The dunes now only 9m high and easy to cross. Many of the dunes had wattles growing on them. Travelled well with the last of the radio broadcast due that night. Madigan had Andy the aboriginal say a few words and then sing a corroboree song followed by Jack. Travelled well during the day with that night’s radio message being messages from the P.M.G. via Harry Ding at Yanta. Everone received mail except for Andy whereby a message was fabricated to please Andy. The day was short with the Hay River being found. Winnecke in 1883 travelled down the Hay River within 8 km of their location. Crocker shot bush turkey for dinner that night. Found evidence of Aboriginals travelling down the Hay in good seasons with flint tools. A fourth radio broadcast was made with everyone except for Andy and Jack to give a one minute talk. Travelled about 16km down the Hay River. The river was of a sandy valley between dunes that was full of trees (Box Gums) and shrubs. Simpson had dropped his knife somewhere along the river the day before. Andy headed back and found the knife. Madigan was keen to locate and cross the rabbit-proof fence on the Queensland border this day. The dunes started to increase again to 15m and the Spinifex was very dense. Womma snake was located and handled by all in the party. Sunset that night no sign of the fence was located but Madigan found out later that this section was not fenced. Madigan now made plans to head for Kaliduwarry Station (Near camp 20) via the Mudloo Well. Early that morning the rabbit fence was located now forming the boundary of the Queensland Simpson NP. A large N-S claypan was crossed. The country became very flat with dry swamps. The day continued with rain preventing any travel. A boundary rider’s hut was located on a high sand ridge besides the fence near the camp. About 1.5 miles east of the camp they found the remains of the old Kaliduwarry Station. That night at Camp 20 a radio message was sent to A Simpson and the men’s family stating that they had reached the Mulligan and that the crossing was over. The day was fine and everything was spread out to dry while everyone bathed and shaved. The going was wet and slippery delaying their expected progress to the Annandale Station. It started to rain again and it was decided to set up camp just north of the Annandale Station. Confined to camp as the rain gently but steadily fell. Next morning was foggy but the rain had stopped. The Annandale Station Kidman Property) was located and a sad ruin amid signs of former prosperity. Their was a drilling plant located near the station and stock yards further south and near camp 22. The day started off very cold and the sand ridges were now very high and separated by plains a mile or more wide. Camp 23 was established and by 9:00 the sky had cleared. On entering the Birdsville area the Waddi trees could be seen and Birdsville was in flood. At 4:00pm the camels stop at the Birdsville pub whereby the party was met by the towns people and leading citizens. 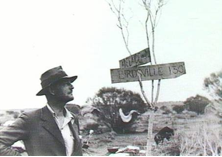 While the Birdsville Pub indicated the crossing of the Simpson Desert, it would be another 26 camps (Camp 51) until they reached the end of the trip down to Marree on the 9th August 1939. Madigan was back in Adelaide on the following day the 10th August 1939. Simpson & Marshall leave party at Birdsville due to Madigan’s regimental discipline. Andy remained in Birdsville for short while courting a Birdsville Aboriginal Lady. It took them 25 days to reach Birdsville and at times the anxiety over food and water supplies, for themselves and the camels, is quite clear, as is the relief when Birdsville came within reach. Ironically, some delays were experienced from rain which made loading camels unwise and, later, water around Lake Eyre made some crossings of usually dry river beds hazardous for camels. Marree was reached on day 51.